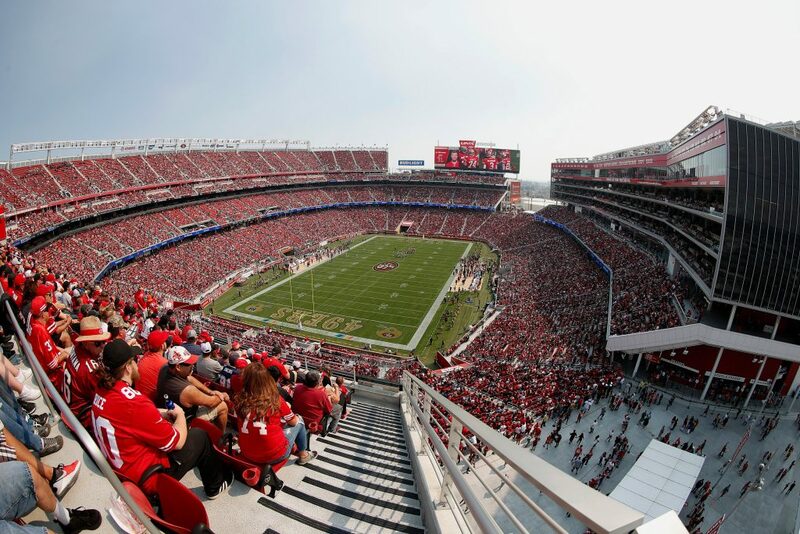 Step inside Levi’s Stadium – built by Silicon Valley and home to the San Francisco 49ers. Opened in 2014, Levi’s Stadium is considered to be among the most high-tech and environmentally friendly stadiums in the NFL. The building cost a cool $1.2 billion to construct and is loaded with cutting-edge technology and sustainability features – exactly what you’d expect from a venue based in the middle of Silicon Valley. And in 2015, this emphasis on innovation was acknowledged when Levi’s Stadium was named the “Sports Facility of the Year” by the Sports Business Journal and “Venue of the Year” by the Stadium Business Awards. 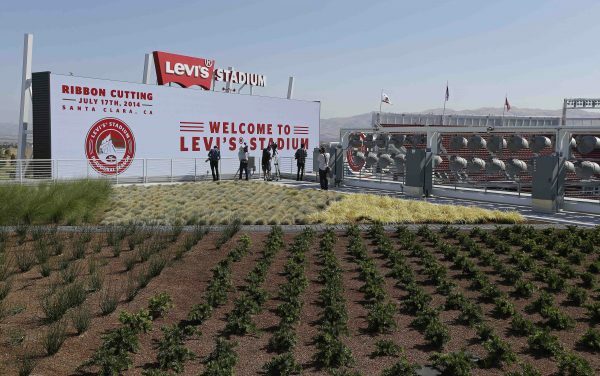 Levi’s Stadium leads the way in “green” building initiatives. Its location in Santa Clara (about an hour outside of San Francisco) was specifically chosen due to its close proximity to public transportation and many of the stadium’s parts were constructed using recycled materials from demolished buildings. On top of this, the venue relies heavily on reclaimed water and houses enough solar panels to power every home game completely through solar energy. These environmentally friendly extra measures all added up to Levi’s Stadium earning LEED Gold certification, a first for an NFL stadium. Perhaps the most unique sustainability feature is the stadium’s 27,000 square foot “Green Roof” that sits on top of the luxury suite tower. This lush garden of 16 native plants growing on the roof naturally lowers the AC and heating required for the suites throughout the year, saving on energy consumption, with the added bonus that the viewing terrace can be booked for memorable ceremonies and receptions. With a fanbase heavily rooted in Silicon Valley, it’s no wonder that the 49ers incorporated plenty of technology when building Levi’s Stadium. The venue offers world-class Wi-Fi service, with over 1,000 access points placed around the stadium, along with 2,500 HDTVs. No matter where you are, you’ll always be connected and never miss a moment of the action. 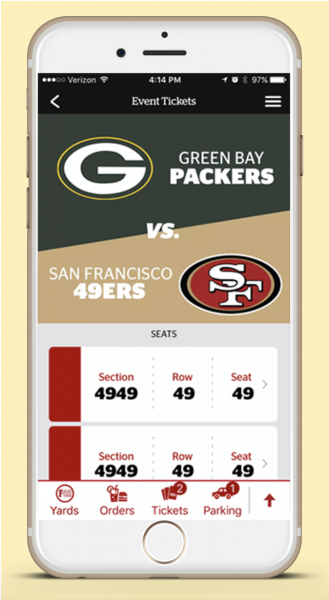 Where Levi’s Stadium truly sets itself apart is with its custom mobile app. Once downloaded, fans get access to a host of helpful features, such as turn-by-turn directions to your seat, search functions to explore the stadium, and real-time game stats. You can also use the app to order food directly to your seat, check the map to see which restroom has the shortest line, and watch a live broadcast of the game from anywhere inside the stadium. 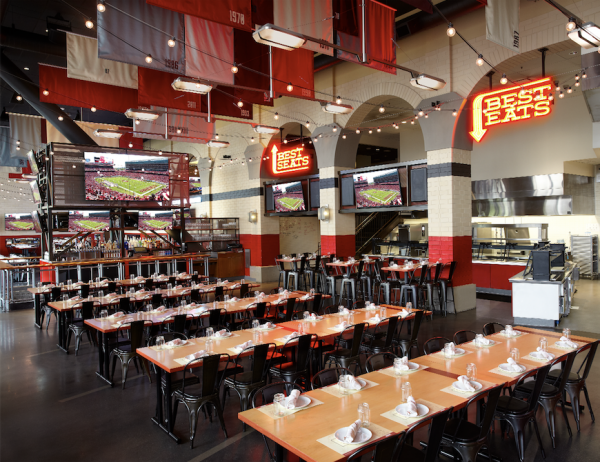 Beyond the normal concession offerings, Levi’s Stadium houses its own high-end steakhouse, Bourbon Stake, along with Bourbon Pub, a more casual dining experience famous for its nachos and soft pretzels. 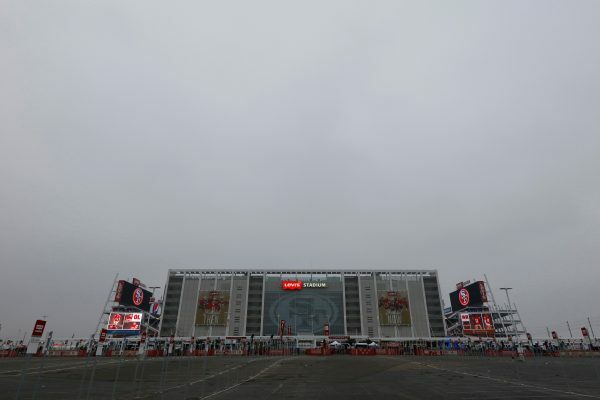 There’s also Michael Mina’s Tailgate, a members-only club exclusively for Levi’s Stadium season ticket holders that offers an fun spin on the traditional football barbecue. If you have time, check out the 49ers Museum. The 20,000 square foot space features 11 exhibits that cover the team’s past and recent successes via curated artifacts, a signature film chronicling the franchise’s heritage, and an engaging interactive augmented reality fan experience. 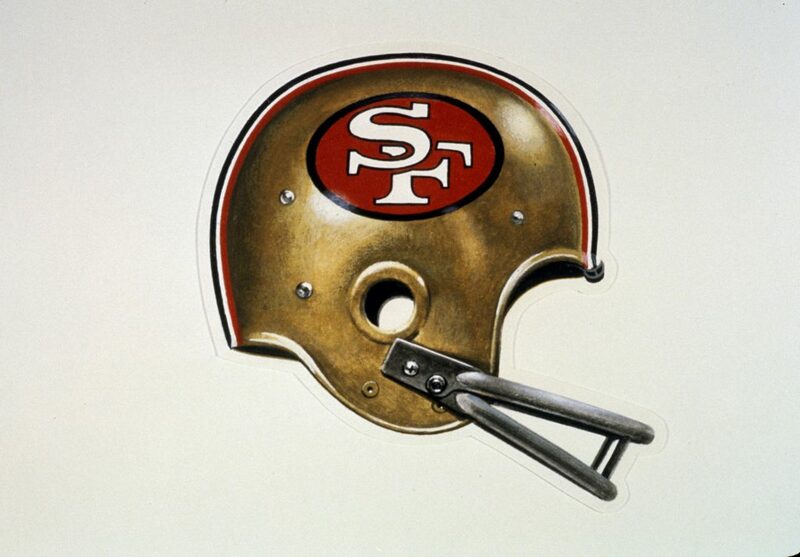 There’s also the Levi’s Stadium Art Collection, a series of local artist galleries that celebrate the team’s storied history and rich culture of San Francisco. Beyond hosting every San Francisco 49ers home game, Levi’s Stadium is a multi-purpose venue capable of putting on the unforgettable events in sports and entertainment, like Super Bowl 50. The biggest names in music (including Beyonce, The Grateful Dead / Fare Thee Well, and Taylor Swift) have used the stadium to put on captivating concerts and the venue will be home to the 2019 NCAA College Football Playoff Championship. Levi’s Stadium was also outfitted to comply with FIFA soccer specifications so it can play host to matches for the US men’s and women’s national soccer teams, as well as house future World Cup matchups. 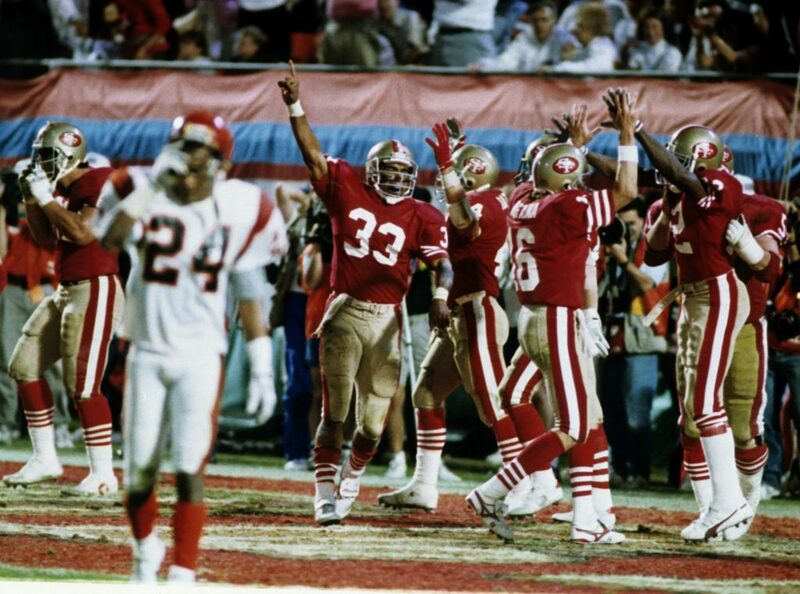 Watch the 49ers go for the gold by purchasing tickets from Ticketmaster – the Official Marketplace of the NFL. Installations, memorabilia, live music, and so much more. Showcasing the stats behind the NFL's biggest supporters during the 2018-19 season.